Whether or not I have insurance, I've got a date with this chair. As you may know, I've been on the hunt for private dental insurance. Because of the way our employers offer plans, this turned into an audit of our health insurance, too. To recap, Peanut and I are lucky to have access to two health insurance plans - one is a high deductible medical-only plan with premiums covered in full by Peanut's employer, and the other is a more traditional medical + dental plan with premiums shared by us and my employer - our share is about $2,300 per year at 2011's prices. The medical part of my plan is okay, but the dental part has an annual cap of $1,000, which I used for 2011 in a single day, and I've got an appointment January 2 that will use up the cap for 2012 in a day as well. So we decided to do some looking around for private dental insurance. Several of you asked me to document the process, so here goes! I started by googling for "individual dental insurance" and "private dental insurance". It's totally overwhelming. A lot of what I saw looked either scammy (cheap, crappy basic websites) or too good to be true. I also found a number of sites that appeared to be for insurance but a closer look showed that it was NOT insurance - there's something called a dental discount plan, which I'll get to in a little bit. Then I started looking up insurance companies that I already know (Aetna, Delta, UHC, BCBS) to see if they offer individual plans that don't have to be attached to a medical plan. Turns out that most of them do, but not in my state. So then I started googling state name + dental insurance, and found a few companies that do offer actual individual dental insurance in my state, but they have a waiting period that would disqualify the appointment I have in January. During this time, I did not enter any personal information into any of these sites. If I could get away with just giving an age and zip code or something, I entered it, but I didn't put a phone number, name, or email address in any of these sites, ESPECIALLY the scammy looking ones. The next step was to start googling some more basic things. I find Ask Metafilter to be a great resource for helping me answer these types of questions that college didn't quite prepare me for, and it didn't disappoint: 1, 2, 3, 4, 5, 6 questions full of relevant answers. I also found this article about the difference between dental insurance and a dental discount plan - basically, dental insurance works the way health insurance does, with copays and deductibles. Dental discount plans SEEM like insurance, and it behooves the companies to present them that way. But really, they just provide discounted prices for you to pay out of pocket, sort of like what insurance companies are able to do for themselves. Dental discount programs typically have some sort of monthly or annual fee, and sometimes there is a waiting period before they go into effect. With this knowledge, I created a full list of all the different insurance companies and dental discount plans that were available to me. Most of the options were not great - the fees were certainly lower than ~$200/month for the combined dental and medical we'd pay through my company, but most of the caps were about the same ($1,000/year), plus all the options had a waiting period that would have affected the dental work I need done in January. Then I started thinking narrower. I like the dentist I'm seeing now; why research a ton of options just to find something that he doesn't take? So I called the billing office and laid out the situation. That sure made it easy. My dentist's office takes most of the insurance I uncovered, but they accept only one dental discount plan, which they are affiliated with. The annual fee was lower than all the other discount plans I found, and there's no waiting period. It offers 25% off all preventive and restorative services including cleaning and x-rays. So that was a pretty easy solution - just go with that. I have one more phone call to make to verify that everything is as it seems, but I expect that to be the case. So I'll be canceling our medical + dental insurance and signing up for this dental discount plan to go into effect January 1. This means we'll go with Peanut's employer's health insurance, which is free to us on a monthly basis but has a $3,200 deductible before kicking in. Once we've paid that much, they cover in-network 100% and out of network 80%. We also get access to a health savings account, which allows you to keep any funds not used in the year for future medical expenses (as opposed to a flex spending account, where you lose those funds at year's end). The high deductible plan makes sense for us - our medical bills are usually quite low (so, lower than the $2,300 we'd pay for my plan) although if we got pregnant next year, they'd suddenly be much larger than ever before (large enough to make the $3,200 deductible kick in, and then insurance would cover everything after that - again cheaper than $2,300 in premiums plus our share of whatever my employer's insurance wouldn't cover). Money Beagle talks about high deductible plans this week, too. Of course, all of these plans make sense according to the 2011 details, which may or may not change significantly for 2012 - I expect that paperwork any day and will be verifying all of it before signing anything. The solution for us definitely wouldn't make sense if we were eligible for a dental plan that wasn't tied to medical (through employers, those are usually very low-cost), and a high deductible medical plan doesn't make sense for anyone who doesn't immediately have the deductible on hand and who isn't at the sweet spot for either low expenses or high expenses in a year. To sum up, if you are researching private dental insurance, I'd recommend starting with your dentist - this would have saved me a ton of time! 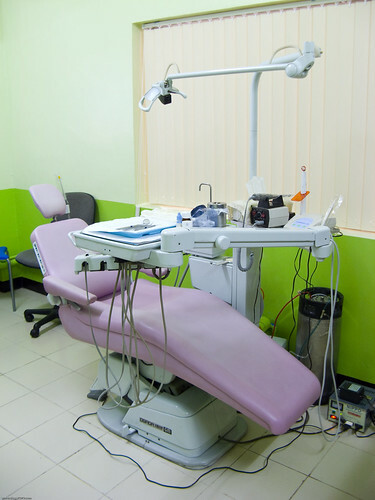 Find out what insurance your dentist takes and find out if any of them offers private policies. Ask about dental discount plans - some of my research indicated that you could use both - ie, insurance for all covered expenses and a discount plan for anything out of pocket (though you'd have to make sure you are saving enough to justify the annual fee for the discount plan). I hope that helps! Any questions? Thank you for chronicling your experience! Very helpful stuff. One thing to be aware of with the high deductible plan is: not all doctors affiliated with a hospital stay are in network. A friend had that kind of plan - had to go in the hospital unexpectedly and was astounded by the bills he got. His hospital was in network, but not everyone (ie anesthesiologist, etc) was in the network. 80% is usually 80% of reasonable and customary and you will be responsible for everything above that. But then again, you have a HSA which will help. I would question whether you really need any dental insurance. Even a really expensive dental procedure would probably not go over $5000. It sounds like you guys could cover a $5000 procedure once or twice in your lifetime. I only by insurance for items that it would be difficult to replace because of the cost. Right now that means: homeowners, liability, auto, life and health. I don't buy insurance for my wedding ring since it's only worth about $5000. Even if I lost it or it were damaged I would probably not buy another one to replace it (although I could afford to). I also don't buy dental insurance because it wouldn't be much trouble to come up with a couple thousand dollars if necessary. How do you handle your hobbies? Book Review: Try! Decide! & Attitude!